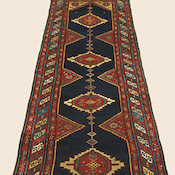 Shahsavan rugs are the geometric patterned textiles constructed by the Shahsavan tribe, a large nomadic pastoralist group residing in Northeastern Persia. This mountainous area, or Transcaucasus, was home to a variety of smaller tribes of different backgrounds, but were loosely united in the 17th century under Shah Abbas (1587-1629). 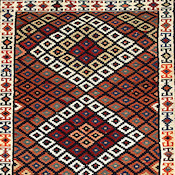 The diverse weaving traditions brought from Turkish, Persian, and Armenian peoples coalesced into an impressive new rug grouping. 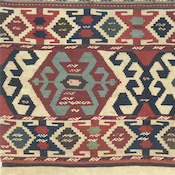 The design work characterizing Shahsavan weavings is highly geometric and replete with an array of vibrant natural dyes. Often, rectilinear medallions are aligned horizontally or vertically across the field, with smaller improvised motifs adorning the background. 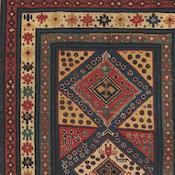 It is also not uncommon to see all over patterns in the field, particularly in runners, while area sizes may be distinguished with stepped or latch hook medallions, the Turkish Memling guls, the ubiquitous boteh pattern, or small animal figures. 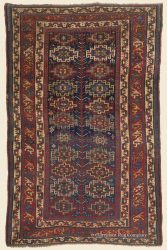 Of great interest to rug lovers are the striking similarities between these Persian rugs and the weavings from the Caucasus. 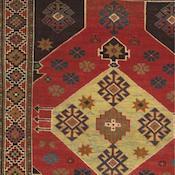 In fact, that Shahsavan rugs have often been referred to as south Caucasians. 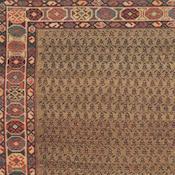 However, Shahsavan weavings rarely adhere to a specific design style the way Caucasian rugs can be identified by regional artistic traditions codified over centuries by a town or area. 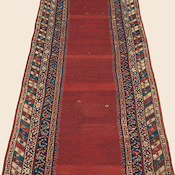 Both areas, only separated by a river, are best known for smaller, area size pile rugs and flatwoven kilims, with the nomadic Shahsavan weavers producing a higher percentage of flatweaves.